Any clinical or nonclinical professional is eligible for RHC. There is no application or fee for RHC. Candidates simply complete the training requirements (in any order) and submit a patient de-identified audio sample for assessment. (Please see the table below). Candidates are notified within two weeks whether or not they met the proficiency level applied for and candidates are provided skill-building recommendations from a MINT health care specialist. How Can I Complete Training Requirements & What are the Tuition Fees? The RHC Motivational Interviewing (MI) Intensive program is an alternative for individuals and organizations who prefer a self-directed, spaced learning learning framework that saves travel and lodging costs, as well as time away from work. It is also a great option for smaller organizations who do not meet the minimum requirement of 25 for an in-house workshop or organizations of any size who would like anytime access to training as new employees come on board. The new program has been designed, developed and evaluated by a team of doctoral-level experts in online learning, health coaching and MI in health care. 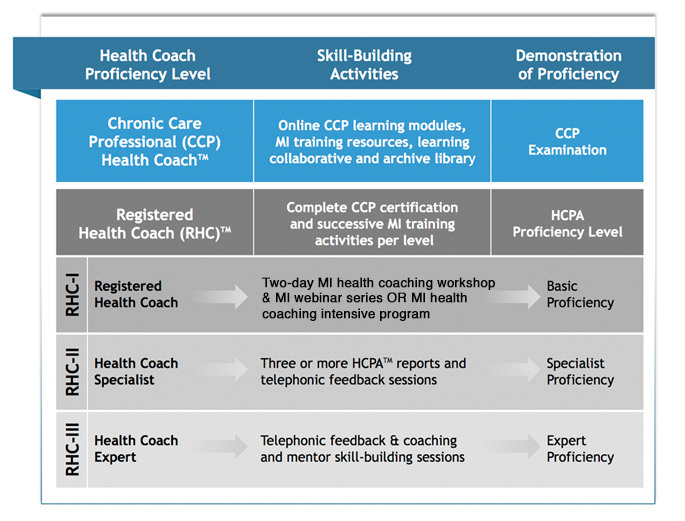 How is Final Health Coaching Proficiency Determined? Upon completion of the training requirements, and participating in any additional self-study, practice or coaching sessions with a MINT health care specialist as needed, an RHC candidate submits a representative audio sample of work with an actual patient (de-identified) or a real health coaching session with a friend or colleague. 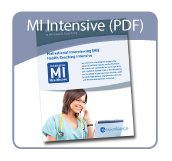 This sample is evaluated by a MINT, HCPA-certified professional using an externally validated measure of MI health coaching proficiency (HCPA). Learn more about the development and validation of the HCPA.